Selling a slightly used Imperial II-class Star Destroyer. Previously (slightly) owned by a navigator of a spice freighter, this vessel has been sitting on my moisture farm and needs to be removed before next year’s harvest. I just haven’t had time to give this classic the attention it deserves and my loss is some-one else’s gain! 1,600 meters in length this bad boy has a maximum atmospheric speed of 975 km/h and an acceleration of >2,300 g. It’s got a Class 2 hyper-drive system still in working order with a backup Class 8. SFS I-a2b solar ionization reactor is in good to excellent shape. KDY Destroyer-I ion engine turns over on the first try but may need a new serpentine belt. As you can see by the picture provided, the deflector shield generator domes are intact. That is a state of the art ISD-72x. Fully equipped with LeGrange targeting computers, heavy ion cannons, Phylon Q7 tractor beam projectors, leather bucket seats, and a 15 disc cd changer. 36,000 tons of cargo capacity, this beauty was ran with a crew of 37,085 but you can pull it off with a minimum of 5,000 leaving you plenty of room to pack in a few extra AT-AT walkers, TIE starfighters, prefabricated garrison bases, Lambda-class shuttles, yards of soil, spool after spool of pipe, and jet skis. This superstructure is perfect for long road trips with the family, discovering new galaxies, picking up girls for dates, and general destruction of your enemies. Have you ever seen what a Star Destroyer can do to the surface of an unshielded planet? Stones run like water and sand turns to glass. With just a little TLC, this baby can be good as new. Brand new this beauty of the skies runs at about 145,670,000 credits, but do to some carbon scoring I can be flexible on the price. Realistically, I just need it removed from my property, so all offers or trades will be considered. Make me an offer, no mind tricks. First come, first serve basis. You are responsible for towing. That’s just a good bargain. 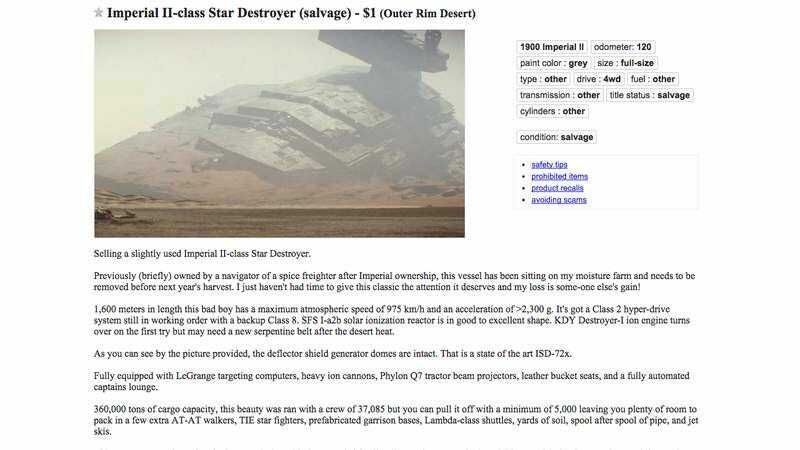 Many of these are being pulled down by Craigslist, so those interested in grabbing a crashed Star Destroyer should act fast!